Where'd that field go? Installing permission sets with field permissions in group and professional edition. I had a question come up the other day from Scott Hemmeter of Arrowpointe. Scott asked how managed permission sets with field permissions work when installing in a group or professional edition org. To simplify this post, I'm going to focus primarily on professional edition but much of this also applies to group edition as well. Customizable profiles is automatically enabled in enterprise and unlimited edition orgs and is an add-on feature for professional edition orgs. If you have customizable profiles, you can create and edit profiles or permission sets, create more than one page layout per object, and create FLS (field level security also known as field permissions) in your org. 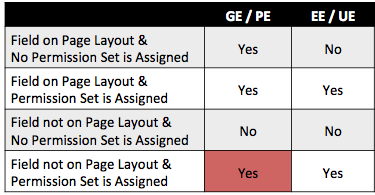 Unlike enterprise and unlimited edition where a user would need both FLS and the field exposed on the layout to see it on an individual record, the way a professional edition administrator controls access to a field is by adding it to the one page layout they are given for each object, at which time the field becomes available throughout the org. However, there's nothing stopping a professional edition administrator from installing a managed package with permission sets that contain FLS. This has the potential to 'hide' fields from users who have this permission set assigned but do not have this field added to their page layout. As a result, a best practice for ISVs is to include all fields on their packaged page layouts to ensure that a user would see this field everywhere. For example, lets assume a managed package has both a new field and a permission set granting read or read and edit FLS for that field. FLS on an installed permission sets is considered additive access for any user assigned the permission set – the only place where the field may appear 'hidden' in fact is the layout if the installed layout doesn't already have those fields exposed and even then the subscriber admin can always add the fields back to the layouts if they really want to. So if you are an administrator in a professional edition org and you notice that there is a field that is not appearing on a record but a user says they can still see it in some other interface, there's a good chance there's a permission set assigned to the user and you should either remove the permission set assignment or add the field to the page layout so the user can see it everywhere. "Why does salesforce not allow us to change the permissions of standard profiles to standard objects? I know the workaround to use is to clone that standard profile into a custom one, but it seems like a pretty random limitation to impose." Profiles are an extension of licensing in salesforce.com. Licenses enforce access and define the maximum allowed permissions for a user. Profiles are actually the glue that connects licenses and users together. Every time you create a user, you specify a license and then assign a profile from a picklist that only includes profiles that share the same license. Under the covers, a profile is actually the middle object between user and license. Every time a license is added to an org, we automatically create one or more 'standard' profiles with immutable user and object permissions. You'll notice that other things on 'standard' profiles can be changed like assigned apps, tab settings, and record types. A best practice for customers with the ability to create 'custom' profiles is to use these 'standard' profiles as templates in order to clone and create their own. In some editions where custom profiles are not allowed, assigning 'standard' profiles is the only way to provide access for users. Check out this blog posting to understand more about this best practice. The 'standard' profiles are also considered managed just as components in an appexchange package are managed by an ISV (Independent Software Vendor). 'Custom' profiles, similar to any other customization in your org that you create, are considered not managed and have special rules that protect them from being changed during a release cycle. From release to release, we may add an object or a new set of functionality that we want to license differently. A full CRM salesforce license may get access automatically to some new sales feature whereas the platform license may not. When we upgrade our code during the release, we may allow and enable access to these objects and new features through object and user permissions on 'standard' profiles. But you'll notice that we almost never change your 'custom' profiles. This enables easier transition through our release process since you can choose whether to include access to these new objects or new features in your own 'custom' profiles. Another reason why we will enable certain objects or user permissions in the 'standard' profiles is that they are used in group and professional editions where there is no ability to clone or customize a profile and you wouldn't get access to new features or objects unless we enabled permissions automatically on our 'standard' profiles. There are many reasons why 'standard' profiles are immutable and I hope this blog posting helps illuminate why.